The assassination of Franz Ferdinand, heir to the Austro-Hungarian throne, shocked the world and set the stage for one of most destructive wars witnessed by mankind. Ferdinand was on an official visit to Sarajevo, the capital of Bosnia, when he and his wife were shot in their car, point blank whilst driving from the town hall. Both died shortly after from their injuries. The Austro-Hungarian Empire occupied Bosnia in 1878 and formally annexed it in 1908. As such, the Austro-Hungarian Royal Family (the Hapsburgs) were seen as “despotic oppressors” by Serbian nationalists. Serbia desired separatism and unification for Slavic people, a great many of whom resided in Bosnia. It was the Serbian nationalist organisation, The Black Hand, that orchestrated the Archduke’s assassination. The group’s original plan failed spectacularly. The Illustrated London News reported that the first assassin threw a bomb into the Archduke’s car which the Archduke then proceeded to hurl from the vehicle. It exploded close to the front wheel of the following car, injuring the people inside but failing to kill the intended targets. It was decided that the safest course of action would be for the Archduke and his wife to leave the town hall and return home. However, the driver had not been informed that a new route had been planned to avoid any waiting assassins. He turned down Franz Joseph Street, but stopped and began to reverse after the Archduke informed him of his mistake. 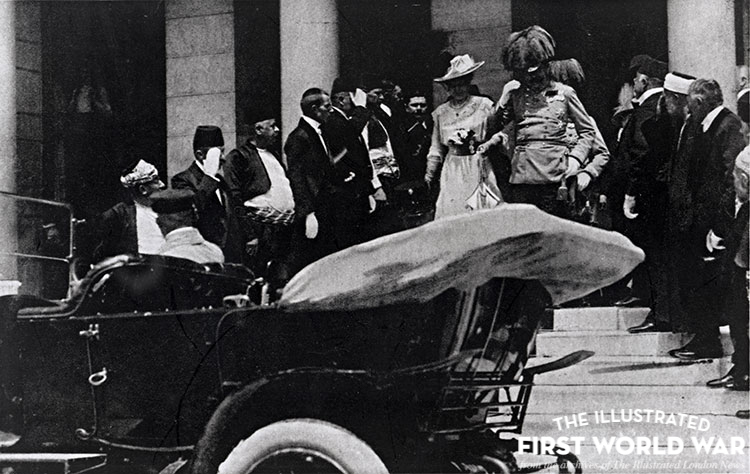 In this moment Gavrilo Princip, one of the assassins, spotted them. Princip drew his revolver and fired. One bullet hit the Duchess Sophie in the stomach and the other plunged into the Archduke’s neck. into a full blown war. Click here to browse our archives for articles on Franz Ferdinand’s assassination.